Boursin Mashed Potatoes - AMAZING!!! Creamy, buttery and out-of this world delicious! Yukon gold potatoes, Boursin cheese, cream cheese, butter, salt, pepper, half-and-half. So easy and they taste amazing! Perfect for holiday meals!! This summer we went to a dinner party and they were serving Boursin Cheese as an appetizer. Chicken Legs fell in love with Boursin cheese. Have you had Boursin cheese? OMG! SO good!! When I was thinking about new side dishes for Thanksgiving, I knew I had to make something with Boursin cheese. 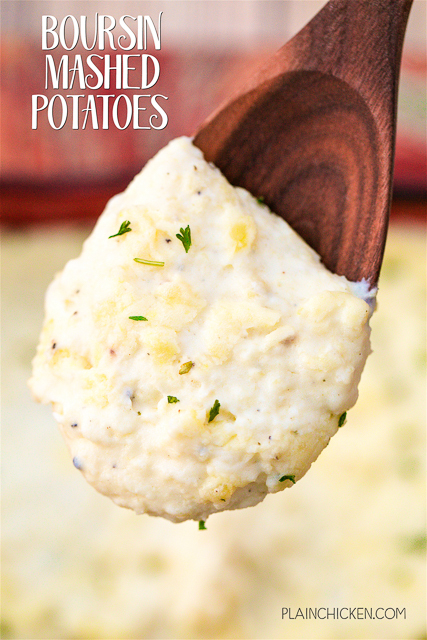 These Boursin Mashed Potatoes are ah-mazing! SO creamy and buttery and out of this would delicious!! I used Yukon gold potatoes in this recipe. Yukon gold potatoes are my favorite. They are very creamy when whipped and work perfectly in this dish. 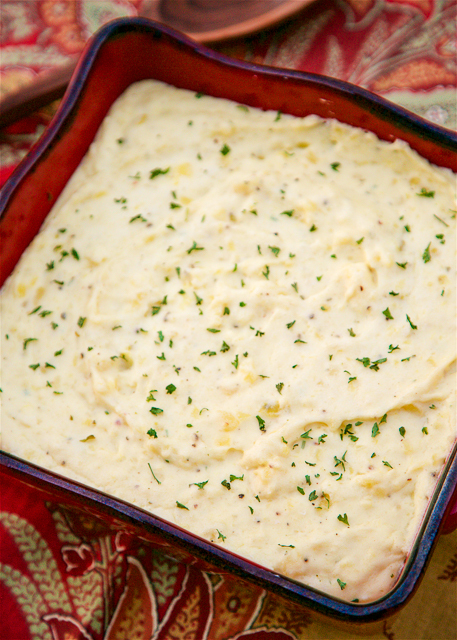 These Boursin Mashed Potatoes are super easy to make and only require 15 minutes of baking. I like to pop them in the oven after I take the turkey out. By the time the turkey is carved, the potatoes are nice and warm. Preheat oven to 350ºF. Lightly spray a 9x9-inch pan with cooking spray. Bring potatoes and water to cover to a boil in a large saucepan. Reduce heat and cook for 15 to 20 minutes, until tender. Drain and return potatoes to saucepan. Add remaining ingredients to saucepan and beat at medium speed with an electric mixer until smooth. Spoon into prepared pan. Cook for 15 minutes. Garnish with parsley, if desired. Looks like a great recipe - hard to go wrong with Boursin Cheese. What type of Boursin Cheese did you use? I know there are different flavors available. Thank you. Do these reheat well? I was thinking of prepping them the day before and baking the day of, just to get some things out of the way early. Thank you! These would be a great make ahead side dish - enjoy!